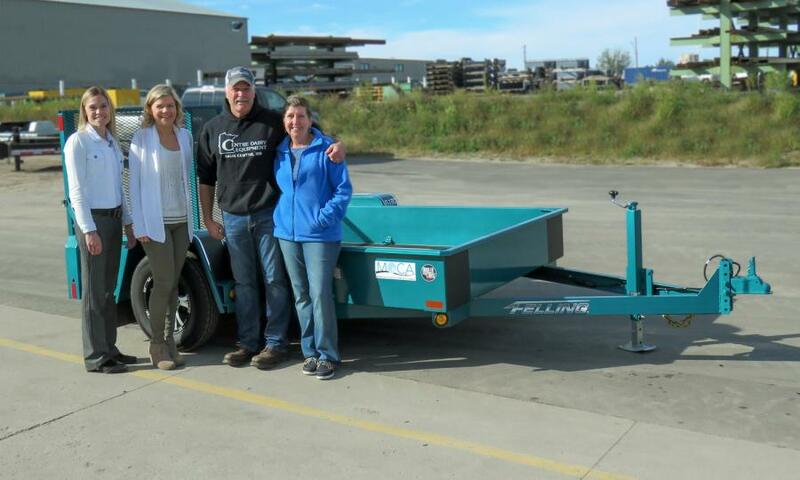 (L-R) are Brenda Jennissen, Felling Trailers Inc. CEO; Bonnie Radjenovich, Felling Trailers Inc. VP of HR; and bid winners Jon and Laurie Stein, Centre Dairy Equipment & Supply Inc.
Felling Trailers Inc. conducted its sixth annual online auction of an FT-3 drop deck utility trailer to benefit a non-profit organization: Minnesota Ovarian Cancer Alliance (MOCA). The winning bid of $3,400 was placed in the last minutes before the auction closed on Sept. 21st, 2018. The bid winner was local Sauk Centre business owner Jon Stein, owner of Centre Dairy Equipment & Supply Inc. Stein's business is located a short distance from Felling's Sauk Centre location where the trailer was on display leading up to the auction. Once Stein saw the teal trailer and the organization it would benefit, his mind was set to bid on it. Stein's wife Laurie is an ovarian cancer survivor. Laurie was diagnosed in November of 2017, underwent surgery and chemotherapy treatment. “It was a rough winter, but we're doing good now,” said Stein. After placing the winning bid, Stein went home to tell Laurie the news. “I didn't even know he was going to bid on the trailer. He said 'you'll never guess what color it is.' I said teal? I said, oh did you buy it for me and gave him a big hug,” said Laurie. Laurie recently had her 3-month check-up, and everything is continuing to look good. Leading with his heart, this is Steins's second Trailer for a Cause that he has bid on and won. He was the bid winner on Felling's inaugural Trailer for a Cause auction in 2013 that benefited Bright Pink, a non-profit organization that focuses on the prevention and early detection of breast and ovarian cancer. “A good friend of the family had breast cancer, so the pink trailer had a lot of meaning for us,” said Jon. The 2018 Trailer for a Cause FT-3 utility trailer was painted in MOCA's signature teal color and dawned the MOCA emblem. Taskmaster Components donated the wheels/tires and PPG Industries donated the custom metallic teal paint for this trailer and cause. Felling Trailers wanted to bring awareness of and support to those individuals who take part in and benefit from the events and services provided by the Minnesota Ovarian Cancer Alliance (MOCA). The online auction ran for seven days, from Sept. 15 thru Sept. 21, ending with Stein's winning bid of $3,400. One hundred percent of the $3,400 winning bid benefits Minnesota Ovarian Cancer Alliance. Minnesota Ovarian Cancer Alliance (MOCA) is a statewide non-profit organization dedicated to raising awareness, providing education and support to women and families impacted by the disease and funding the research needed to detect ovarian cancer early and treat it properly. Since MOCA was founded in 1999, the organization has grown to more than 1,000 survivors and 45,000 donors and active members with a full range of programs encompassing education, support, and research. With its 2018 funding, MOCA has awarded more than $8 million to research projects for ovarian cancer research in Minnesota. For more information, call 612/822-0500 or visit www.mnovarian.org. For more information about Felling Trailiers, call 800/245-2809, or visit www.felling.com.